Teen clothes have never been this cool. Perfect for the petite junior who is looking for something special and unique. Roxy is wearing the Reversible Lace Back Dress in Composition A, she is 5' tall and wears size XS in this dress. She also wears XXS in the Jumpsuit, which should give you an idea of how our teen clothes run. Angela is 5'4" and is wearing the Reversible Twirly Skirt in City Lights and wears a size small in this skirt. All of these styles are fun to dress up or down. 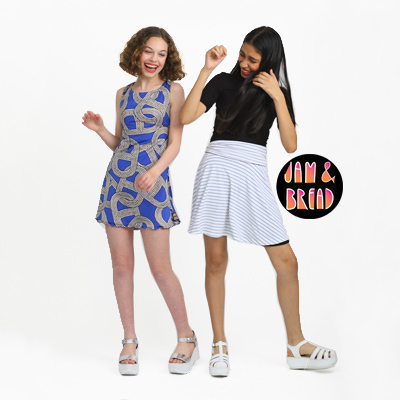 One thing that sets apart our teen clothes from other brands is that our line was actually designed by a teen! When our daughter aged out of TwirlyGirl, she had a hard time finding clothing that reflected not only her personality, but that of her friends. The apple doesn't fall far from the tree, so she grabbed a sketchbook and outlined the kind of clothes that she wanted to wear. The response from her peers was so strong, we immediately put her designs into production. So if your child has long been a TwirlyGirl fan, but is now craving a more mature, sophisticated look, look no further than our teen clothes. They have the same quality and spirit that you have grown to love and trust... perfect for the teen who is now evolving into fashion that is more sporty, but not yet adult. Our teen clothes are also easy to care for. Simply machine wash and tumble dry low or air dry. No dry cleaning or special care require. Perfect for the teen on the go. Some of our teen clothing styles are reversible, giving her two looks in one. The only thing we can't help you with is getting your teen to pick her clothes off the floor. Good luck with that one.